The Best Meal Replacement Shake to Help You in Your Weight Loss Journey. Helps control hunger and cravings for up to 3 hours with a hunger-blocking blend. No “deprivation” feelings. You get to enjoy delicious meal replacement shakes every day! 11g high-quality whey protein helps you build lean muscle when combined with exercise. Convenient and affordable, just CA$2.76 per meal or less! When you’re trying to lose weight, what you eat makes all the difference. Being able to control your nutrition is so important to achieving success! If you struggle with hunger and aren’t able to reduce the number of calories you’re currently eating, you won’t lose weight. That’s where a meal replacement shake comes into play! A delicious meal replacement shake that blocks hunger and reduces cravings can help you control calories and effectively lose weight. It’s a convenient way to reduce your overall calories while helping you feel full. But not all meal replacement shakes are created equal, and you deserve the best. You need a meal replacement shake that blocks hunger and tastes so good you won’t feel like you’re depriving yourself. 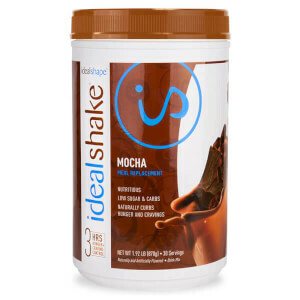 You need IdealShake! The biggest roadblock to reaching your weight loss goal is hunger. If you can’t control hunger, you’ll have a hard time managing weight. At IdealShape, we knew that which is why we’ve included a trifecta of hunger blocking ingredients in our meal replacement shakes. Not only do you get fiber and protein to help you feel full and satisfied after your shake, but we also added Slendesta, a unique appetite suppressant that will keep your hunger at bay for up to 3 hours. Controlling your hunger is an absolute must when you’re trying to lose weight. It’s no fun to feel hungry constantly, and it’s extremely difficult to fight against hunger for a long period of time. That’s where Slendesta comes in. Slendesta is a hunger blocking ingredient that’s been shown to help suppress hunger for up to 3 hours. It’s made from a potato protein extract called proteinase inhibitor (PI2) that promotes and extends the body’s natural release of cholecystokinin (CCK), a hormone that sends the signal that you’re full. We include Slendesta in our weight loss shakes to help you effectively beat hunger while reducing calories. Say goodbye to hunger cravings with a meal replacement shake with Slendesta! We include protein in all of our meal replacement shakes for several reasons. The first is the hunger-fighting ability of protein. Of the three macronutrients, protein, carbs, and fat, the most satiating is protein. It’s more satisfying than carbs or fat, and when you eat protein, you’ll feel full for longer. Protein also helps to preserve lean muscle mass as you lose weight, promoting greater fat-burning and less muscle loss as you reduce calories during your weight loss protocol. That’s not to say that you should disregard carbs or fat, but protein is perhaps the most important of the three when you’re trying to lose weight. 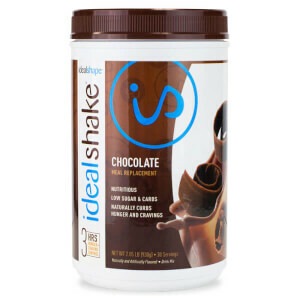 Not all protein is created equal though, which is why IdealShake is made with whey, a high-quality protein source. Whey protein has a higher bioavailability than pea protein, rice protein, or almost any other protein source. That means a higher percentage of the protein you consume from whey is actually used by the body. This makes whey the perfect protein source for your weight loss shake! Another key hunger blocking ingredient is fiber. Fiber is not metabolized and it moves through your system slowly, holding hunger at bay and helping to keep you feeling full for longer. That’s why we include fiber in all our meal replacement shakes! But that’s not all it’s good for. Fiber has other important jobs within the body. Fiber aids in digestion and helps to keep you regular. It also has a positive impact on blood sugar regulation and has been shown to help lower cholesterol! For decades now you’ve heard about low-carb diets for weight loss. In fact, some would have you believe that any carbs will sabotage your weight loss goals, but this simply is not the case. It’s true that too many carbs can be detrimental to weight loss, but some carbs are important to healthy and effective weight loss! They provide energy to help keep your body fueled. Our meal replacement shakes provide enough carbs to help support a healthy lifestyle. Dietary fat is often portrayed as the villain when it comes to macronutrients. But does eating fat make you fat? The short answer is no, it doesn’t! Your body uses fat for energy, vitamin absorption, and even for hormone regulation. Fat does have more calories per gram than carbs or protein, so it’s important not to eat too much. But some fat is necessary for optimal health and wellness! 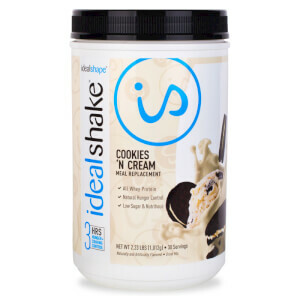 IdealShake provides enough fat to be an effective meal replacement shake for weight loss. Carbs, fat & protein are important, but good nutrition isn’t just about macronutrients. It’s also about getting enough vitamins and minerals every day! These important nutrients do everything from supporting your immune system, helping to fight against fatigue, and so much more. In order for IdealShake to be the best meal replacement shake for weight loss, it must give your body what it needs to be healthy. So, we've packed it full of 18 essential vitamins and minerals! Added sugars, like those found in soda, candy, baked goods, and virtually all sweet treats should be considered public enemy number one for those trying to burn fat and manage weight. Eating foods high in added sugar makes your body want to hold on to fat, even when you’re restricting calories. That’s why IdealShake is sweetened with sugar-free sweeteners (Sucralose and Ace-K), and contains less sugar than some other weight loss shakes! One reason why IdealShake is the best meal replacement shake is that it helps you control your nutrition even when you don’t have time to prepare a meal. You don’t have to carry your meals with you in a plastic container or rely on vending machines. 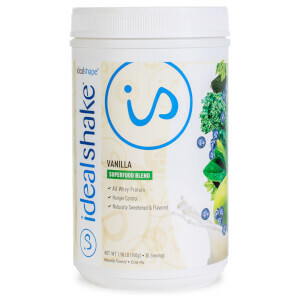 Simply mix a single serving of IdealShake with your liquid of choice and voila, you have a meal! 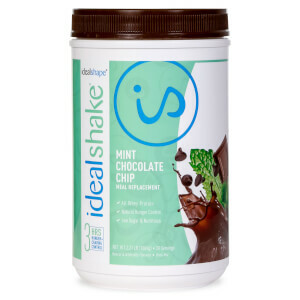 Beyond the convenience factor of a grab-and-go meal replacement is the cost-effectiveness of IdealShake. A single serving of our meal replacement shake costs just CA$2.76 per serving. Not even the drive-thru value menu can compete with that! When it comes to flavor, we believe meal replacement shakes for weight loss should not just taste good but should be absolutely delicious! This high standard for flavor is apparent, as we go through many rounds of flavor testing to get the best flavor possible. That’s why IdealShake is the best-tasting diet shake out there! We totally get that which is why we offer a wide range of flavors like chocolate, salted caramel, cookies and cream, and even seasonal favorites! We could go on forever about how awesome IdealShake is, but we don’t expect you to take our word for it, we want you to try it yourself! And we’re so sure you’ll love our meal replacement shakes that we’re willing to put our money where our mouth is. 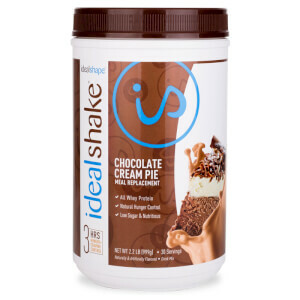 If you aren’t satisfied with IdealShake, we offer a 30-day money back guarantee. That’s right! If you don’t love your meal replacement shake, we’ll refund your purchase. No questions asked!*. Our IdealShake (Chocolate, Vanilla, Strawberry, Mocha, Chocolate Peanut butter, Salted Caramel, Chocolate Cream Pie) are gluten-free. Note: Our IdealShake Cookies and Cream isn’t gluten-free. There are two essential elements to losing weight. First, in order to lose weight you have to be able to control your appetite and reduce the amount of calories you consume. The second essential element is that you have to be able to stick to your plan in order to see results ldealShake helps you achieve both of these goals. 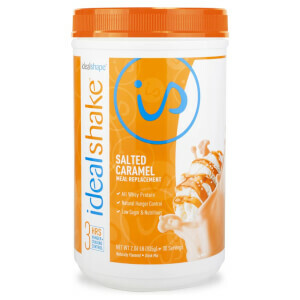 With a delicious taste that can't be beat, sticking with ldealShake is not a struggle. Our shake comes in a variety of decadent flavors that both men and women love. 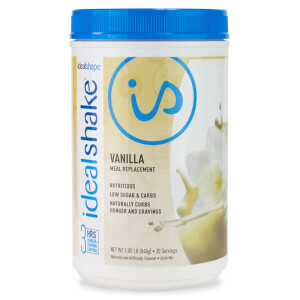 ldealShake tastes great if you mix it with water or milk, but it also makes a yummy and healthy addition to a smoothie. The flavor combinations are endless. We have specially formulated our mix to help your weight loss needs.